Even before the type 224 was rejected for the F7/30 specification, R.J. began working on a new project, the type 300, which would become the Spitfire. It was intended to use the Goshawk engine – so again the design included a strong metal leading edge in front of the wing spar to act as the condensation tank for the steam cooling. When the new Rolls-Royce PV-12 engine (later to become the Merlin) was substituted, the strong metal leading edge was retained because the Merlin was originally envisaged as having steam cooling like the Goshawk, albeit with a small back-up radiator. After the first few Mk A and B Merlins used this composite cooling system, the Mk C and all subsequent Merlins switched to an all-liquid system. This used Ethylene Glycol, which transferred heat better than water and hence meant the radiators could be made smaller. The strong leading edge structure of the Spitfire’s wing was no longer needed as a condenser tank, but it was retained. Out of such fluke design evolutions was the classic Spitfire wing developed, the key to the aircraft’s success. The wing was extremely strong, having a central spar made up of hollow sections that slotted into each other. The result was not unlike a leaf-spring, providing great resilience. The metal leading edge “box” in front of the spar added very much to this strength. The wheels retracted outwards into the wing, meaning the undercarriage mechanism could be put in the thickest part of the wing, this knowingly kept the wing thin. The undercarriage retracted into bays to the rear of the wing spar meaning the structural integrity of the the spar-leading edge “box” was not impaired. To aid the flying qualities of the aircraft, the wings incorporated “wash-out” meaning the angle to the air flow was slightly greater near the fuselage than at the tip. It meant the pilot got plenty of warning of a stall, as the aircraft would start to “talk” to the pilot through feedback to the controls. This is particularly important in combat as in a tight turn the aircraft needs to be kept just on the “edge” of stalling to get the minimum turning circle. The Spitfire’s wing turned out to be capable of withstanding very high Mach numbers. In fact the wing’s performance at high speed was often better than the wings designed for the early jet fighters ten years later. The design work was well advanced when the RAF asked for an armament of eight machine guns in all new fighter aircraft. This change is often credited to Sqn/Ldr Ralph Sorley, but Colin Sinnott in his book The RAF and Aircraft Design 1923-1939 shows that the RAF was calling for 6 or 8 guns in fighters well before Sorley joined the Air Staff. Over at the Hawker aircraft company, Sydney Camm who was designing the Hurricane, had no problems fitting the guns close together in the thick wing of the Hawker fighter. However, Mitchell wanted to keep the Spitfire’s wings as thin as possible. To do this and accommodate not only the guns, but also their ammunition boxes, the guns had to be spread out along the wing. Mitchell had adopted an elliptical wing plan for his new aircraft, and this proved capable of holding four machine guns in each wing rather than the two it was originally envisioned as taking. Contrary to what is frequently stated, the elliptical wing design of the Spitfire hadn’t been chosen primarily for its aerodynamic efficiency. The initial design of the type 300 featured a straight-tapered wing. In the end, it was the requirement for eight wing-mounted guns that prompted Mitchell to adopt the elliptical planform to provide more room for the guns outside of the wheel wells. Mitchell gave the type 300 a monocoque fuselage, which meant that the interior was unobstructed by bracing struts or wires. This was in contrast with the Hurricane, which had a fuselage constructed around a welded steel frame much like a fabric-covered biplane. The space inside the Spitfire was later put to good use in photo-reconnaissance Spitfires where large cameras were mounted behind the pilot pointing downwards and to the side. The Spitfire’s fuel tank was mounted between the engine and the pilot. The Spitfire was not designed to carry fuel in the wings. Only later was fuel put in the wings, inside the leading edge torsion box, for reconnaissance Spitfires – at the expense of armament. The fighter Spitfire was always restricted to a short range, although to be fair all other single-seat fighters of the same vintage, except for the Japanese Zero, had the same problem. The Allies had to wait for the later Mustang and Thunderbolt before they had fighters that had a range of 1,000 miles or more. 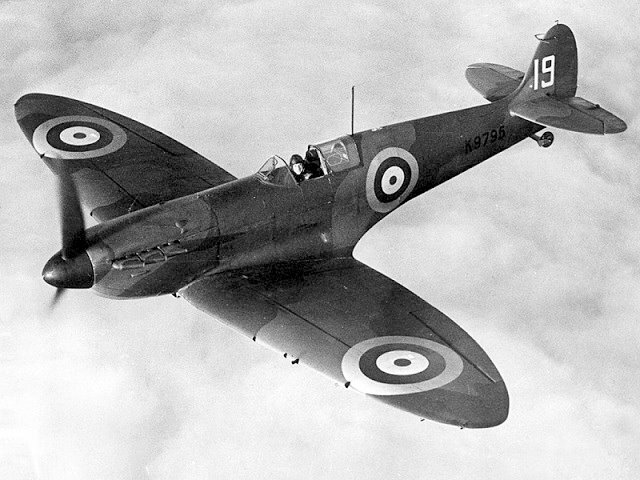 For a brief initial period, the Type 300 Spitfire was developed by Supermarine as a private venture. Vickers attitude to developing the Spitfire is particularly admirable when it is remembered that Vickers Aircraft itself had spent a lot of time and money on its own single engine fighters, the Jockey and the Venom. The latter was very much in with a chance of winning Air Ministry production orders when the Spitfire design was first started. A myth has grown up that RAF showed little interest in the Type 300 Spitfire and that Sir Robert allowed no “intervention” from the Air Ministry. In fact the RAF seems to have welcomed the Type 300 Spitfire development very early on, even before the Type 224 had been rejected for F7/30. At first they regarded the Spitfire as a “high speed technology demonstrator” which would push forward aircraft design, but it quickly became apparent that the new aircraft would be suitable for production as a front-line fighter. The RAF produced Specification F10/35 around the Spitfire and considerably reduced their normal requirements for fuel capacity and range to comply with the Supermarine design. It is also the Air Ministry which put up the money for building of the prototype. Mitchell devoted most of the year 1935 to work on the Spitfire. Two people on the design team deserve special mention; Beverly Shenstone, Canadian aerodynamicist, did the outstanding wing design and Alfred Faddy who did much of the detail design work. The Spitfire prototype, with the serial number K5054, first flew from what is now Southampton airport on the 5th March 1936. Piloted by “Mutt” Summers, it was reported to handle beautifully. In later tests it reached 349 mph. There was no doubting that Mitchell had delivered the goods. Even before the prototype had completed its official trials the RAF ordered 310 Spitfires, the success of Mitchell’s design was assured. The era of the monoplane piston-engined fighter lasted only some 15 years, from about 1935 to 1950. The Spitfire was unique in that it was the only aircraft to span this whole period and stay “the best”. This is the true mark of Mitchell’s Genius. 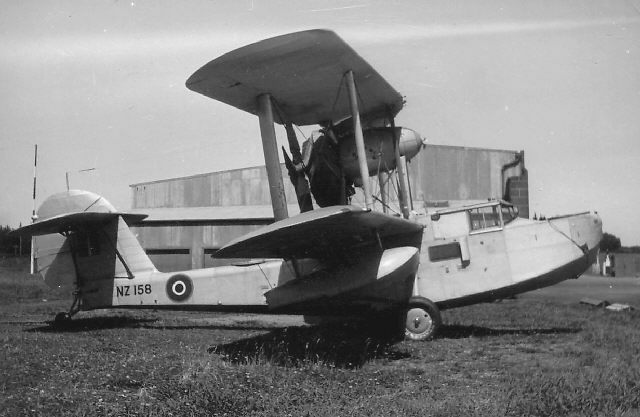 Mitchell’s other outstanding design of the immediate pre-war period was the Walrus amphibian, which built itself a reputation for ruggedness in the air-sea rescue role. Also, a design which was often in the news in the early thirties was the “Air Yacht”, a flying boat for the wealthy to “cruise” between the fashionable French and Italian coastal resorts. Looking at the Supermarine Walrus it is hard to imagine that this aircraft was produced during almost the same period as the Spitfire. Despite this contrast, the Walrus was one of the most successful of Mitchell’s designs. The B12/36 could have given the RAF a bomber superior to every other World War II type except maybe the B-29 Superfortress. As it was, Supermarine just did not have the workforce or factory capacity to push forward the project and when the prototype was destroyed on its jigs, during the Luftwaffe attack on the Woolston Supermarine factory in September 1940, the bomber project was abandoned. My painting of the Supermarine B12/36 as first designed by Mitchell (it was revised after his death) – attacked by Heinkel 113 fighters. It was in 1936 that Mitchell was again diagnosed to have cancer. In February 1937 he went into hospital in London but returned to his home soon after. Mitchell had to give up work, however he was often seen watching the testing of the Spitfire prototype at Eastleigh airfield from his motor-car when he should have been home resting. He flew to Vienna for treatment in late April 1937 but returned to England at the end of May. During the last months of his life he liked to sit in his garden, admire the flowers and listen to the bird-song. He died of cancer on the 11th June 1937 at the age of forty-two. The responsibility for the development of the Spitfire fell to “Joe” Smith, who had served as Supermarine’s chief draughtsman for many years. The Mitchells had one son, Gordon. It is perhaps surprising that for years no proper biography of Mitchell had ever been published. It therefore fell to Doctor Gordon Mitchell to tell his father’s story in two books R.J. Mitchell – World Famous Aircraft Designer and R.J.Mitchell – Schooldays to Spitfire. During the war, Leslie Howard, best remembered today for his role as Ashley in Gone With The Wind, and one of the finest British film directors of the day, made a dramatised film of the story of the development of the Spitfire. It is more poignant for knowing that Howard himself was killed by the Nazis later in the war when an aeroplane carrying him home to England over the Bay of Biscay was singled out for interception by the Luftwaffe. Called The First Of The Few and first shown in cinemas in 1942, the film is propaganda, but of a gentle and particularly English kind. The opening sequence on an RAF station during the Battle of Britain looks a little awkward until you realise that these are not actors but actual serving pilots who fought in the Battle. The film traces the story of Mitchell and the Spitfire from Supermarine’s Schneider Cup winning year of 1922 up to Mitchell’s death and beyond to the Battle of Britain. David Niven provides comic relief as a girl chasing test-pilot. Rosamund John plays Florence Mitchell. Howard himself plays Mitchell with a performance that non other than Noel Coward said was “acting that transcended acting”. In lieu of a proper biography of R.J. Mitchell the film has been taken as a true record of Mitchell’s life. However there are some departures from the strict truth. Firstly the nature of Mitchell’s illness is not touched upon, but this is more than understandable given the attitudes towards colostomy at the time. Somehow the myth grew that R.J. Mitchell died from tuberculosis, even today this misconception is sometimes repeated on web sites and magazine articles. Next the film gives the impression that Mitchell worked himself to death and gave up the chance of a recovery to finish the Spitfire in time for the coming war. This seems to be dramatic licence, it was not unusual for Mitchell to work late at the office but he also enjoyed a full family life and to have regularly taken part in sports like tennis, golf, snooker, shooting and sailing (he could often disappear for a couple of hours during the working day – sailing his boat from the factory slipway). Indeed the remarkable thing is that he led such a well-rounded life while suffering from serious illness and at the same time heading a design team producing the most advanced aircraft of the age. Also, during Mitchell’s last year it was the design of the Supermarine B12/36 bomber, the R1/36 fast flying boat and the F37/35 four-cannon fighter that preoccupied him, rather than the Spitfire. Lastly an episode in the film where Mitchell and Niven’s test-pilot character go to Germany in the early 1930’s seems to be a complete invention. However it is possible that Howard was incorporating events that occurred to Mutt Summers (Vickers/Supermarine test pilot and the pilot of the prototype Spitfire) or Beverly Shenstone (Vickers/Supermarine’s aerodynamicist) both of whom visited or worked in Germany in this period. Mitchell’s wife also had a skiing holiday in Austria in the mid 1930’s. In any event the scene where Mitchell meets Messerschmitt in a German Inn and comes away convinced he must design a fighter to protect Britain must be one of the most dramatic inventions in cinema history. “They can’t take the Spitfires Mitch! By the way, R.J. Mitchell was never known as “Reg” or “Reginald” except by his wife or parents. In true British middle class between-wars fashion he would have been called “Mitchell” or “R.J.” by his peers and “Mr Mitchell” by those who worked for him. The only exception to this were the pilots of the RAF high-speed flight who took part in the Schneider races, they alone called him “Mitch”. All who now live in peace and freedom would do well to remember that one man can make a difference and be thankful that Mitchell’s Spitfire was ready in the summer of 1940. “R.J. 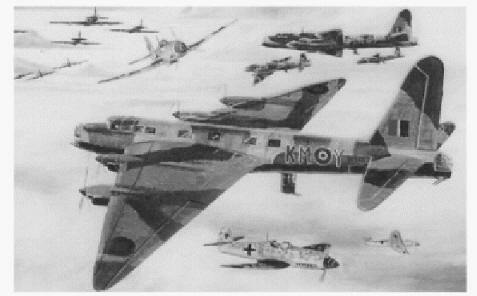 Mitchell – World Famous Aircraft Designer” by Gordon Mitchell. ISBN 0 947750 053. Published by Nelson and Saunders. “R.J. Mitchell, Schooldays to Spitfire” by Gordon Mitchell. ISBN 0 7524 23223. Published by Tempus Publishing Ltd.
“Eagle to Spitfire – Pictorial Tribute to the Designs of R.J. Mitchell” – An article by John Godwin in Air Enthusiast Issue 71 (Sept/Oct 1997). “Spitfire Mitchell” – An article in “The Book of Flying” published by Evans Brothers Ltd 1948. “Birth of a Legend – the Spitfire” by Jeffrey Quill. Published by Quiller Press, ISBN 0907621 64 3. I WONDERED IF RJ MITCHELL MET BARNES WALLIS AS THEY HAD BOTH WORKED FOR VICKERS?